What In The Hell Is Up With Richard Nikoley? I caved, got an air fryer. Because I create delicious dishes, for one. For number two, it is very, very difficult to do stovetop without added fats. It’s really impossible, and I won’t delineate all the reasons why. There is the broiler, but it’s messy, and very hard to control. 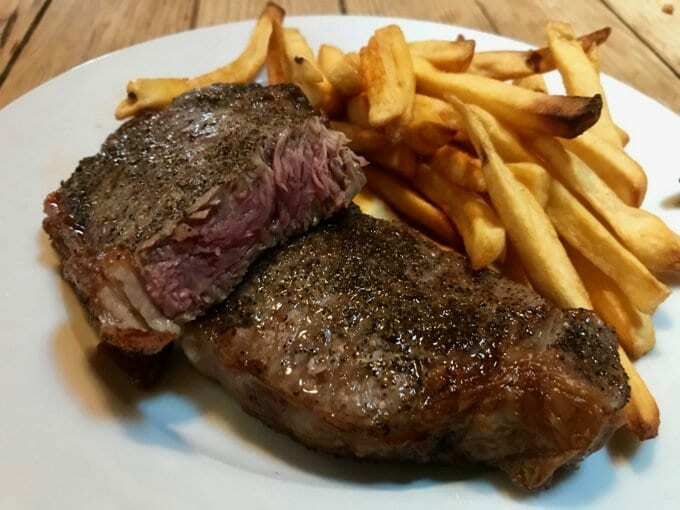 Fish is pretty easy in the oven broiler, but a steak will drive you crazy. Of course, you can grill a steak. But still, you have a mess you eventually have to clean up. I eschewed Air Fryers initially. It’s a convection oven, I estimated. Well, it is, but in concentrated form, quite different, and there is just no mess. In terms of cleanup, beyond your plating, a paper towel or two does it all. I got the 3.4 quart version of this one. You can search around, but I link the larger one will suit more, because usually, most folk are cooking for more than two. At the moment, I’ve been cooking for one, me. A note on what you choose: best not go cheap. I spent a good while reading negative reviews on the units you can get for $45-75 and most common complaints were that the exterior of the unit gets very hot, case warps, stuff doesn’t fit as it should. Also, takes more cooking time. Bottom line, $100-150 entry price, you’re good. The one I got is well engineered. Only warm to the touch exterior, solid, works great. Go big. 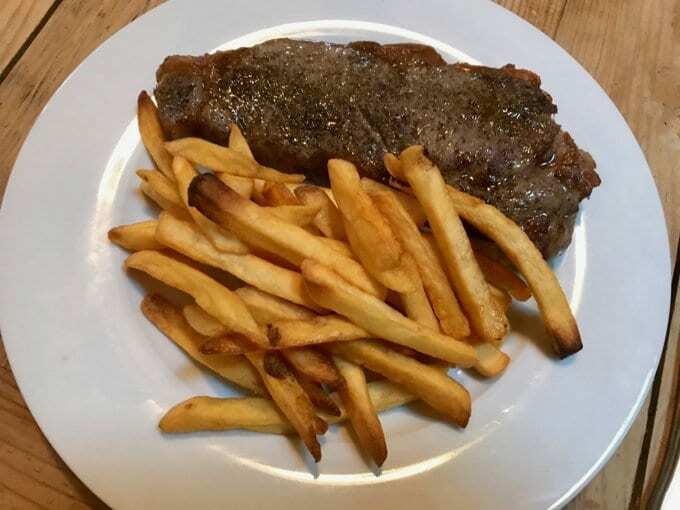 I decided to see if I could do a decent steak frites as an initial try. I got a decent NY Strip, seasoned with salt an pepper. Its’s best to let it sit for 30-40 minutes ahead. I also got a package of frozen fries. It’s not the best choice—you can do your own from fresh fries, coming up—but I wanted to get in quick. For the frozen fries, you’re working at 400F. You put them in for 10 minutes. Toss when you’re done, move aside, and put in your NY for another 10, only, at 360. It is very good, but not as good as grilled. Depends on the trouble you want to go to. But this is a couter-top deal I could have used in a college dorm room to do this (we used to do mac & cheese in electric hot water pots in the 80s). My Nisei dentist told me about rice cookers 30 years ago. I’ve never gone without one since. 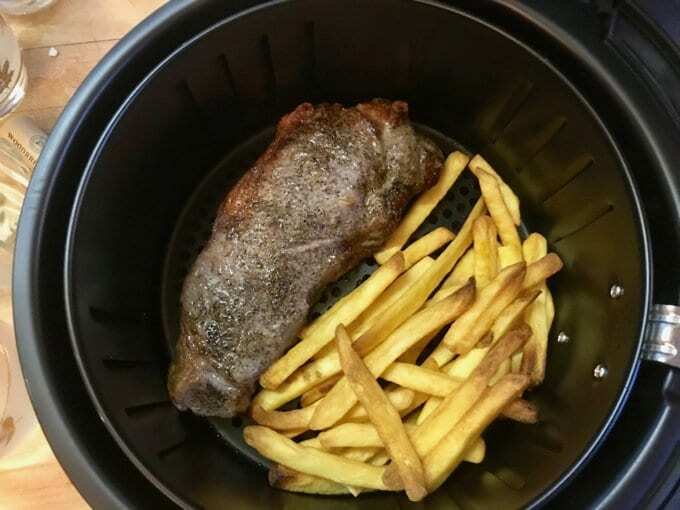 The air fryer sounds like it could be the same thing. Since getting an electric pressure cooker, I haven’t used a rice cooker again. It hard to image, but imagine something even easier than a rice cooker… that does an even better job on the rice. Yep, air fryer is the second most used utensil in the kitchen, after the electric pressure cooker. For my family, even the $200 plastic covered ones didn’t do it, so I got a 16 quart glass one from the local Asian market. Now the kids use it every day, while I use the electric pressure cooker. I no longer endorse Instant Pot pressure cooker; there are others on the market just as good technically. Instant Pot’s owner has been doing a “cloud strategy” so the newer instant pots “phone home” to the cloud. I contacted him about doing some open source software so people could program their instant pots from whatever computer device they own. He wasn’t interested. His “programmable” instant pot requires you to put your cell phone near the pot for the whole time the program is running, using a special cell phone “app” that phones home, and everything goes through his own remote servers. Fascist. No way, Robert Wang. I have no technical issue with his product, but will only go to his competitors now. “cloud strategy” for a kitchen device? Sheesh. Looks like it’s not quite getting that maillard action. John, would finishing it with a butane torch work? Actually a quick sear with a red hot branding iron would work too I guess. So you’re saying kill all cancer sufferers. The guy was way ahead of his time.